Canine cops are quite smart – they possess an amazing sense of smell which allows them to uncannily sniff out those drugs that you have been hiding in your bag. But if you try to harm them in an effort to get them to leave you alone, you could end up being charged with a federal crime. 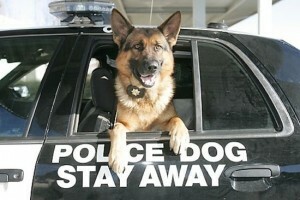 Just recently, the U.S. passed a new law under the Federal Law Enforcement Animal Protection Act. According to this law, anyone who tries to purposely harm or kill law enforcement protection dogs and animals will be fined $1,000 and could also get a 10 year prison sentence. Canines that are part of the Police department serve with equal passion and commitment in order to fight crimes and catch criminals. These dogs undergo extensive K9 training and work on major criminal cases, yet they were only considered police equipment. However, with this new canine cop protection law under the Federal Law Enforcement Animal Protection Act, these intelligent dogs will now be considered equal to other officers, and anyone who dares to hurt them will be charged with a hefty fine and imprisonment. According to Russell Hess, the executive director of the U.S. Police Canine Association, this law will keep criminals from hurting canine cops, who are often the ones taking a bullet for their team. Hess also believes that this strong punishment for hurting a police animal is a great way to put a stop to all those animal cops’ killings. Police protection dogs are the ones to be sent first in high-risk crime scenes including bombing, terrorists, drugs, etc, which is the reason these protection dogs are at the highest risk of getting harmed or killed. The law enforcement animals, especially dogs, play a vital role in helping the squad locate criminals and detect drugs and weapons. Although there are no national statistics on the number of police protection dogs’ killings, law enforcement says that the number of animal killings were on the rise at the time the bill was passed. Senior vice president for communications and government affairs at the Humane Society, Wayne Pacelle, believes that violent behavior towards animals implies tendencies of violence against human beings and hence should be taken seriously by law enforcement agencies. A person who is capable of hurting animals is someone who has tendency to be cruel and harmful to humans. This law against harming police dogs and animals will ensure that they are safe and are not considered mere police toys that are the first to get killed. It is also a kind of recognition for police dogs who work hard on-duty, tackle dangerous situation, come in close contact with criminals, and risk their lives to protect their squad. As a protection dog training company, we applaud the government for passing this law in an effort to keep the dogs we love safe.